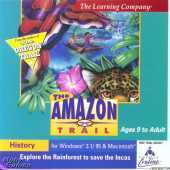 This is an educational computer game inspired by the popularity of The Oregon Trail, featuring the areas surrounding the Amazon River and some of its tributaries. The player is asked to set out on a quest for the Incas, and along the way, learn about the people who live and use the river for their survival. The player is told in a dream the Inca people are endangered by malaria and European explorers, and he or she will be taken back in time in order to search for cinchona. While on the quest, players find themselves meeting various people along the river (both friendly and unfriendly), taking photographs of the flora and fauna of the area, fishing, and capsizing their canoes. When they reach the hidden city in which the Inca are living, players are graded on various aspects of the game, including the amount of activity on the journey, the number of plants and animals correctly identified in the rain forest, health of the player, the amount of time taken, and, depending on the version of the game, the completion of mini-quests. Originally in DOS, in 1994 a Win3.x version was released on both floppy and cd versions. In 1996, a Windows CD version was released with more equipment items available, in addition to voice acting, and more enhanced mini-games and graphics.